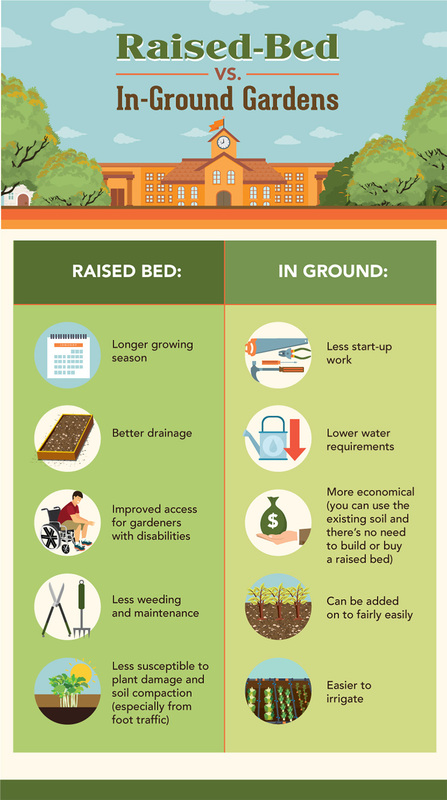 These benefits should encourage anyone – teacher, administrator, parent, or student – to advocate for designing a school garden at their own school. Not sure where to start? 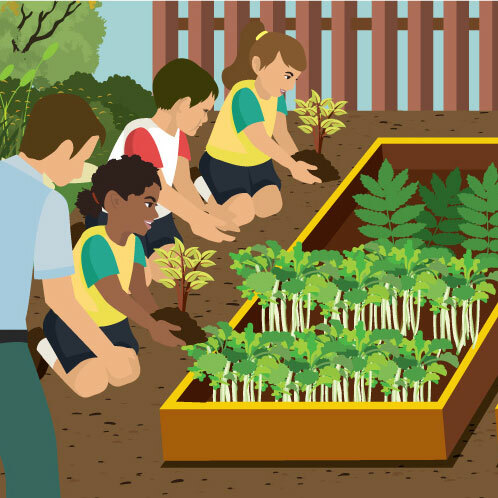 Here’s a basic guide to grow your school garden dream into a reality. Ready to embrace gardening at your school? Follow these steps for a healthy harvest. Before designing a school garden, you’ll likely need approval from critical parties (namely school administrators and possibly funders). Unless the administration is already on board, prepare a justification for why the school should invest in a garden. Before planting anything, it’s important to think about what kind of garden you want to create, what size it will be, and how you will utilize that space. If you’re operating on a small budget, it’s also helpful to think about potential budget-friendly resources.22 Can you send a letter home with students asking their parents to donate extra gardening tools and gloves? Could local farmers or local garden clubs donate seed packets or volunteer their expertise? Could local college students volunteer their time? There are all kinds of resources out there – the sooner you investigate these options, the better chance you can stay on budget. If you’re planting directly in existing soil, you need to prepare it for planting. This is assuming you already tested the soil and deemed it fit for gardening.23 If the soil hasn’t been planted in a long time – or ever – it’s probably best to till it; you can do so manually or with rented or borrowed equipment.24Just be careful not to over-till, which can compact the soil. (A good rule of thumb is to only till each row one time. )25 Be sure to till close to the day you plant so the soil is still broken up by the time you add plants. If you built new raised beds or container gardens, then add fresh soil before planting. After all the planning is done, there’s nothing left to do but get down in the dirt and plant, weed, and tend to your garden. You may make mistakes along the way, and that’s okay – use them as valuable learning opportunities for students. Try to involve students in every stage, from designing the garden and preparing the soil to planting the first seeds (or starter plants) and harvesting the fruits of their labor.26 Involvement helps instill a sense of pride, responsibility, confidence, and investment. The more students, teachers, and volunteers work in the garden, the more everybody can learn how to tend it so it stays healthy and produces food for years to come. While planning and caring for a school garden takes a lot of work, it’s also a lot of fun – and getting students engaged makes it all the more enjoyable. By approaching school gardening with an open mind and a spirit of natural wonder, you’ll model a great attitude for students and ensure gardening remains rewarding no matter what you harvest. Happy planting!